THEY'RE known for their witty puns and satirical news sense. The Betoota Advocate has wormed its way into the heart of arguably every Aussie with its larrikin-like take on local, national and global news matters. This week editor-at-large Errol Parker and Betoota local and editor Clancy Overell made their way from way out west to the bright lights of Rockhampton for Beef Australia 2018. Taking to the stage on Tuesday, the boys gave locals an insight into their much loved humour before taking to the stage again the same night at the Rockhampton Leagues Club for a second show. While Errol got a cold one at the bar, Clancy chatted with The Morning Bulletin about the shows they put on while in town and the secrets behind their comical writing. "We're doing a project with Beyond Blue and have been roped into shows, talking about the current affairs and that kind of stuff, all for a good cause," Clancy said. 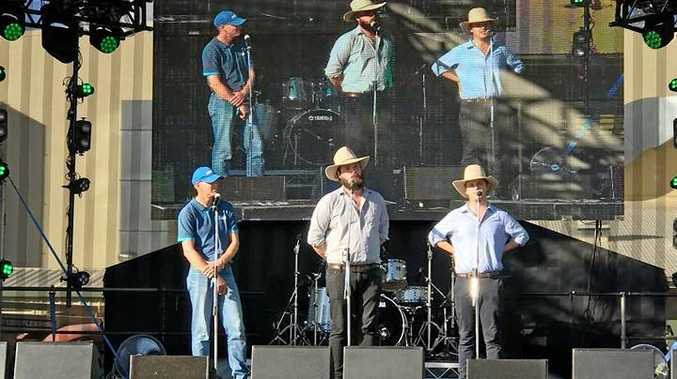 "We've got the budget being announced and a lot of stuff politically in Queensland happening and here at Beef Week, so we're looking forward to working the crowd and saying hello to some old friends while we're here." Clancy said while the Betoota Advocate had been around for a while it was really Errol and himself that kick started the online platform that made the news outlet well known. "It's been in existence for a while but we definitely took it to an online space and it's been great fun," he said. "Everyone involved in the Advocate comes from media backgrounds and around the bush and we all like trying to project the things we like and do to this kind of audience and community here at Beef. "We just do a different take on the news from a bush perspective, but with that we cover all things around the country."